Geodes & agates fascinate me! You never know until you open them what sort of magic lies inside. Beautiful colors that seem to melt into each other, sparkling crystals, each one totally unique. 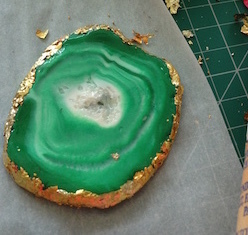 I wanted to capture the essence of a geode/agate slice in clay – and I am pleased with the result! 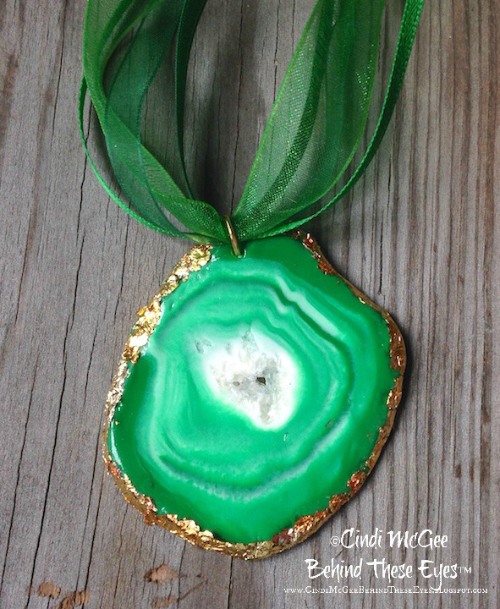 This Faux Green Agate Slice pendant was made with Makin’s Clay®, which has a softer nature than oven bake clays, allowing the layered shades of clay to blend and meld together beautifully for this finished effect. Roll a small amount white Makin’s Clay using clay roller to about 3” in width and 1/8” thick. Tip: Place any unused clay in sealed plastic bag with damp paper towel or moist towelette to ensure freshness for later use. 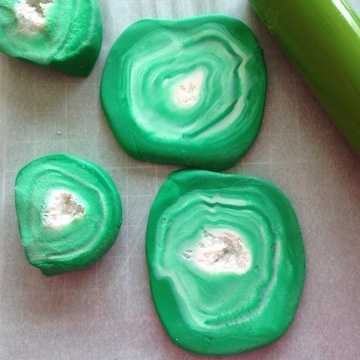 Pour about a tablespoon of Clear Ice Roxs in a line in center of rolled white clay. 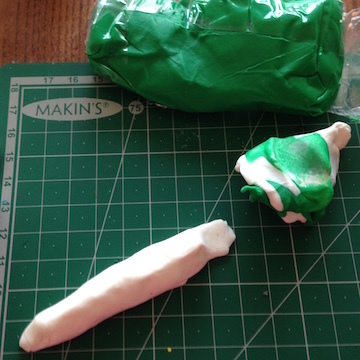 Fold sides of clay up and over the Roxs to create a tube, with the Roxs in the center. Pinch to seal the ends of the tube. 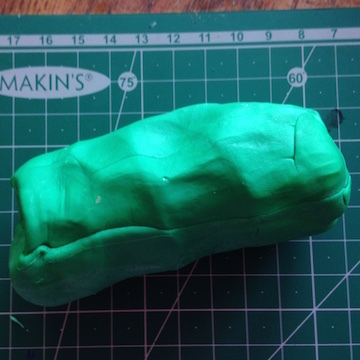 Blend a small amount of green Makin’s Clay with white clay, blending just until marbelized. Roll to about 4” in width and 1/8” thick. Place white roll in center and fold ends around white tube. 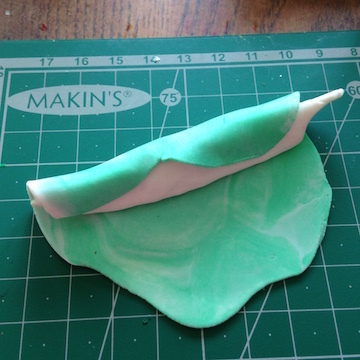 Repeat step 4 multiple times, varying the amount of green and white clay, for different shade variations. Roll some sheets of green clay. 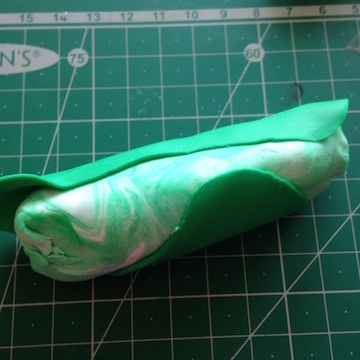 Continue wrapping the cane with each piece of rolled clay, varying the blended sheets with the solid green sheets, until your finished cane is about 2” thick. 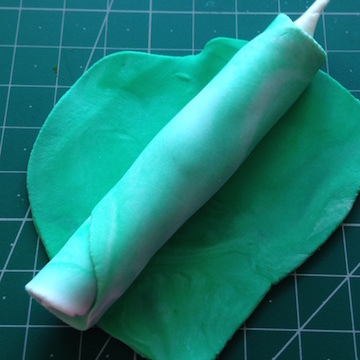 Fold in ends of the cane, and compress cane together with hands to tightly pack the layers. 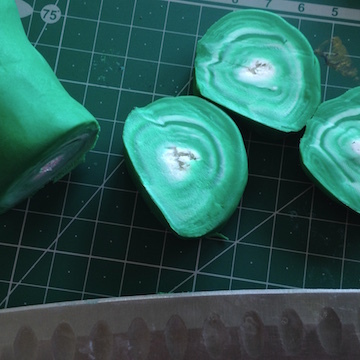 Use sharp knife to cut the cane into slices about 1/3” thick. 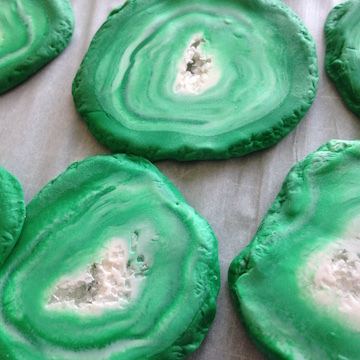 Use roller to flatten each slice slightly to create your “geode/agate” slices. The goal is to not have perfectly round slices, irregular shapes gives a more natural effect. Crumple aluminum foil. 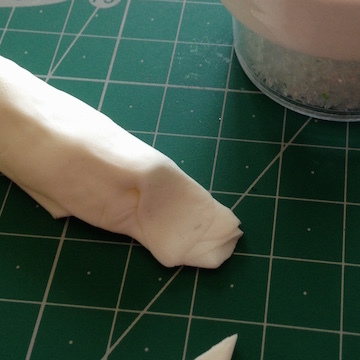 Press into edges of each slice to texture. Let dry 24 hours. 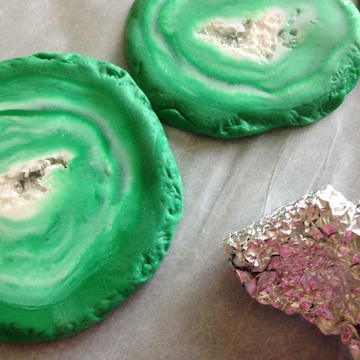 Apply a light coat of Diamond Glaze around the textured edge of each slice. While it is still wet, add gold foil leafing. 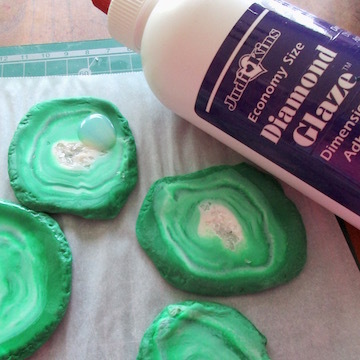 Apply a thin layer of Diamond Glaze to the front of each slice. Let dry, then apply a thin layer to the back of each slice. Let dry. 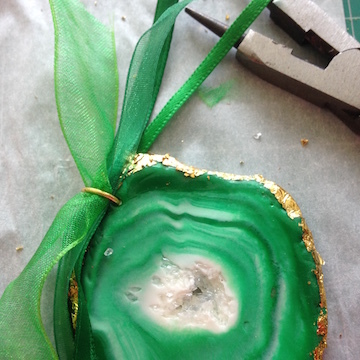 The Diamond Glaze adds a polished shine to the faux geode/agate slices, and also seals the Roxs into the center of each slice without diminishing their crystalized sparkle. 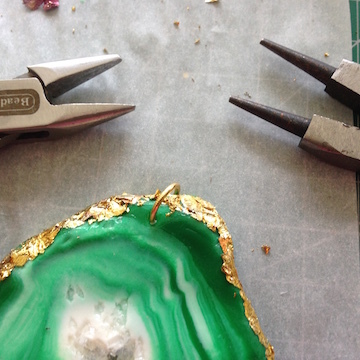 Use a needle to make a hole in one edge of each geode slice for jump ring. 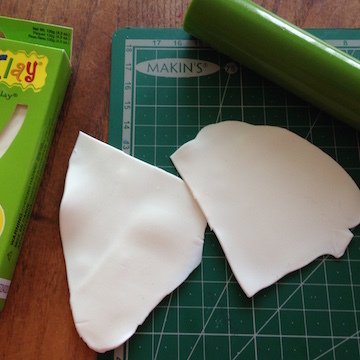 Makin’s Clay stays flexible even when dry, so you will easily be able to push the needle through the slices of clay. Add gold jump ring to each slice. Add ribbons or satin cording, and add closure to end of ribbons. Wow, what a neat beautiful piece! I got to try this technique.